Thank you for continuing to use our products and services. The Hitachi Solutions Group is at the center of the information and communication systems companies that belong to the Hitachi Group. As an IT company, we provide solutions to support social life and corporate activities, in diverse fields ranging from finance and the public and social sectors to manufacturing and distribution. Information technology is integral to today's social infrastructure, and we aim to provide system integration and services of unsurpassed quality and dependability, guided by the corporate principles of "contributing to the growth of our customers and the global community via unique solutions based on reliable technologies." The globalization of business and diversification of customer needs today means that the business environment for the IT sector is changing with unprecedented speed. We are focusing on expanding our global business and furthering our package software and services business, to keep pace with the global business development of our customers and their shifting needs from IT ownership to utilization of IT. In the global business, we provide IT solutions worldwide, leveraging international subsidiaries in China, the United States and Europe. In the package software and services business, we offer a full range of solutions that meet customer needs, including solutions for security, cloud computing,business continuity planning, and big data that enhance business efficiency and increase value for business expansion. 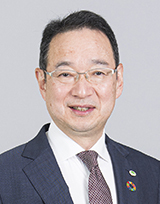 In April 2012, the Hitachi Solutions Group integrated three companies-Hitachi East Japan Solutions, Ltd., Hitachi Chugoku Solutions, Ltd., and Hitachi Solutions Kyushu, Ltd. The addition of these companies based in Sendai, Hiroshima and Fukuoka respectively enhances our ability to broadly provide solutions across Japan. We aim to be a comprehensive provider of hybrid and integrated solutions, by combining a broad range of solutions for overall optimization throughout the business life cycle of our customers. We are dedicated to providing products and services that bring strong value to customers, and welcome your feedback and support moving forward.